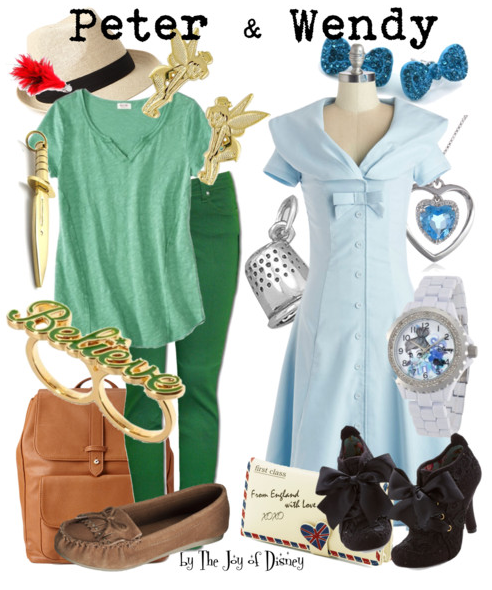 Buy Peter's look: Shirt, $12.99 ; Jeans , $72 ; Shoes, $9.98 ; Bag, $29.80 ; Hat, $10.80 ; Feather Clip , $6.79 ; Believe Ring, $42.50 ; Dagger Pendant , $7.99 ; Earrings, $19.99. Buy Wendy's look: Dress, $139.99 ; Shoes, $164.99 ; Wallet, $29.99 ; Watch, $49.99 ; Necklace , $49 ; Thimble Charm , $9.98 ; Earrings , $8.99. 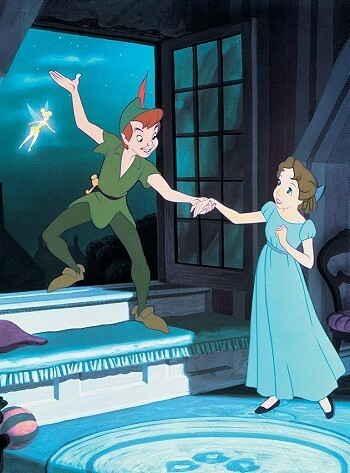 Outfits inspired by Peter Pan and Wendy Darling!! I absolutely love both looks, which one would you wear?